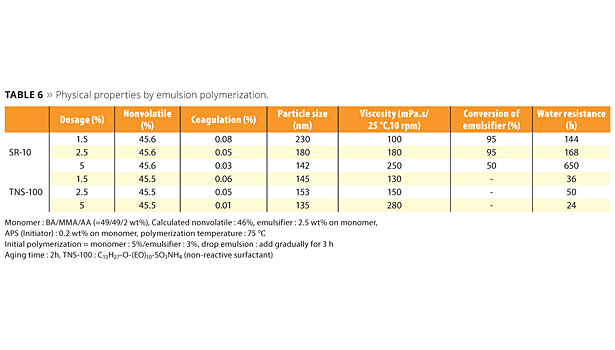 Emulsion polymerization is a typical method applied in surface chemistry. Polymer particles obtained from radical polymerization of monomer, surfactant and initiator in water are usually in the submicron range. The polymer emulsion, called ‘latex’ or just ‘emulsion’, is widely used in industries such as paint, ink, adhesives, cement, construction, paper, textile, etc. (Figure 1). In recent years, research has focused across the various areas of surface chemistry, especially for emulsion polymerization of hybrid composite particles. 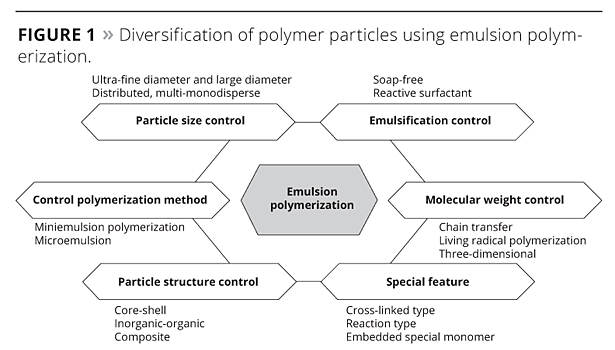 In addition, the evolution of mini-emulsion polymerization1,2 and micro-emulsion polymerization3 has taken place in a field of functional polymers such as those used for electronic materials, toners and liquid crystal spacers. This article discusses the mechanism of emulsion polymerization using reactive emulsifiers, and their role is described with a focus on superiority in water resistance and adhesion properties. Reactive emulsifiers provide the micelles for radical reaction and they are also a kind of monomer that is polymerizable with monomers such as butyl acrylate (BA), methyl methacrylate (MMA), 2-ethylhexyl acrylate (2-EHA), etc. Therefore, there is no free emulsifier left in the emulsion after polymerization, thereby reducing the drawbacks associated with conventional emulsifiers. Functional emulsions using reactive emulsifiers have widespread use and have reached approximately 30% of the Japanese emulsion market.4 The first reactive emulsifiers were launched in the 1970s but were not popular because some had low reactivity and others had low emulsifier ability. A practical reactive emulsifier was launched in Japan in the 1990s that could improve upon the drawbacks mentioned above. Gradually the mechanisms of polymerization kinetics and the generation of oligomers became clearer, and the number of products made using reactive emulsifiers has been expanding. 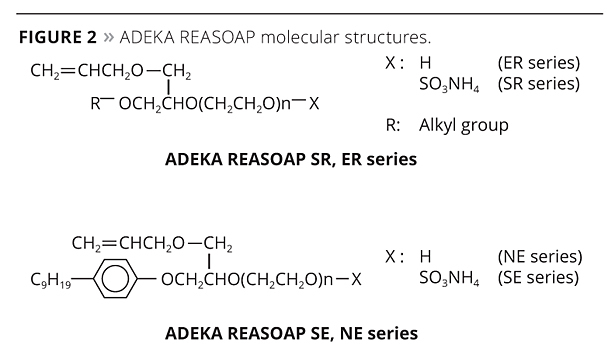 The ADEKA REASOAP Series5-8 are reactive emulsifiers developed with a focus on reactivity and emulsifying ability. The SE Series for anionic and the NE Series for nonionics were launched around 1990.9 These have a nonylphenyl group as a hydrophobic part, which was designated as an endocrine disrupter. Therefore, the SR Series for anionic and ER Series for nonionics were launched as APE-free reactive emulsifiers in the early 2000s. They are now used in a broad range of applications.10 The molecular structure of these reactive emulsifiers is shown in Figure 2, and physical properties are shown in Table 1. 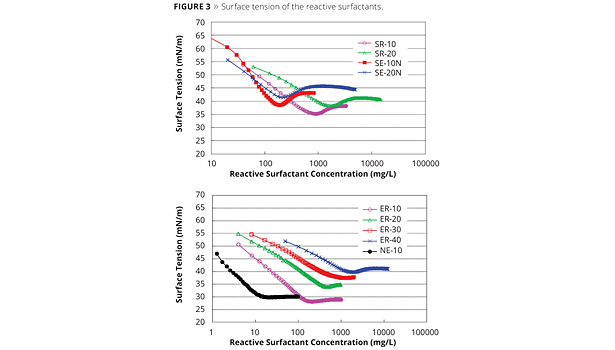 A decrease in surface tension is one of the basic properties of surfactants (Figure 3). 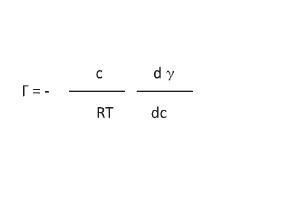 Changes in surface tension are caused by surfactant adsorption at the gas-liquid interface, which is indicated by the Gibbs adsorption equation (Equation 1). a low-hydration counter ion if using an ionic surfactant. 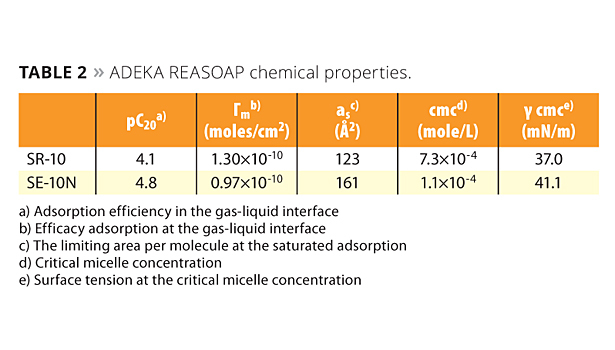 Table 2 shows the chemical properties of ADEKA REASOAP. The pC20 of the series’ SR-10 product is 4.1 mM, and SE-10N is 4.8 mM. They are similar to sodium dodecyl sulfate (SDS), which is a conventional emulsifier (2.5 mM).11 The polyoxyethylene chain of ADEKA REASOAP seems to have a slight influence on pC20. The location of the allyl group is determined by how easily it reacts with monomers that come and go between micelles and monomer droplets. Therefore, the allyl group is located between the hydrophobic and hydrophilic part because of accessibility to monomers. The new reactive emulsifiers have an allyl group as a polymerizable part, and so can be discussed by Q and e values such as with common monomers. The allyl group’s Q value is around 0, and the e value is negative. This means that the allyl group is nonconjugated and is easy to chain transfer, which results in poor reactivity. However Prof. Nagai et al. showed that circumstances inside the micelle can bring overcrowded conditions and make the allyl group easy to polymerize with acryl monomers.12 Figure 5 shows the reactivity of SR-10 with various monomers. Actually, the reactivity of SR-10 varies depending on the monomers. SR-10 can be polymerized easily with BA, 2-EHA, MMA, EA and VAc. 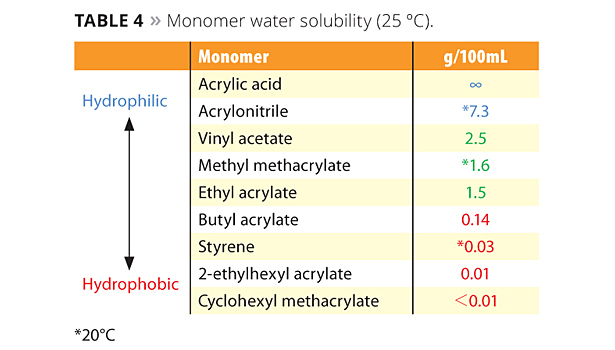 The monomer’s Q and e values (Table 3), and solubility in water (Table 4) create the difference in reactivity with SR-10. Acrylic monomers are highly reactive because they are electron acceptors (e>0). 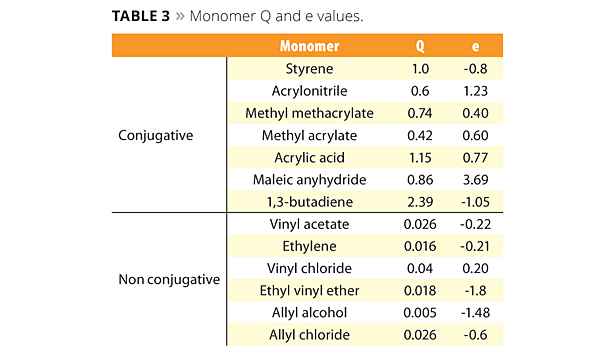 AAc and AN have low reactivity because they are hydrophilic monomers considered to be outside of micelles and away from the allyl group of ADEKA REASOAP (Figure 6). Styrene has low reactivity because it is an electron donor just as the allyl group (e<0). However, styrene reacts well in combination with monomers such as acrylics. Emulsions polymerized with the new reactive emulsifiers can bring excellent water resistance, high transparency and peel strength (adhesion and cohesion), which are the required properties for high-performance films. A concern that free emulsifier will be emitted into the environment is very low because ADEKA REASOAP copolymerizes with various monomers. 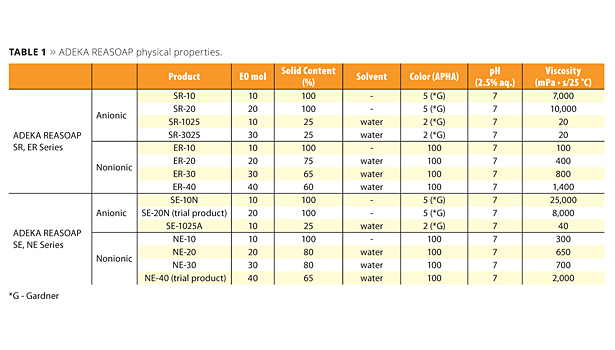 The testing methods and poly-merization data of SR-10 compared with conventional emulsifier TNS-100 are shown in Tables 5 and 6. In this case, BA, MMA and AA were used as monomers. 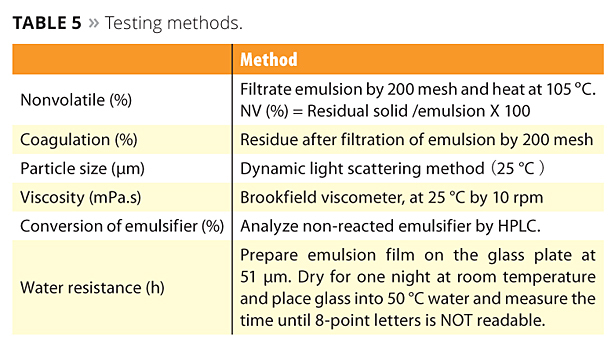 SR-10 can dramatically improve water resistance because emulsifier does not migrate to the film surface (Figure 7). Interestingly, water resistance was improved in accordance with the dosage of SR-10 because the particle size is smaller and the minimum film-forming temperature (MFFT) is lower. It was suggested that certain oligomers may generate and improve the bonding between particles. In the case of a smaller dosage of SR-10, MFFT tends to be higher than conventional emulsifiers because hydrophobicity of the emulsion particle surface disturbs the mutual diffusion between emulsion particles in the film deposition process.13 This means that an anti-plasticizing effect may cause a slightly harder film than when using conventional emulsifiers. Figure 8 shows the conversion change of monomer and SR-10; 80% or more of SR-10 could be polymerized with monomers. In the case of low-Tg emulsions, such as adhesives, ADEKA REASOAP has a strong effect on peel strength and holding power (Figure 9). Generally speaking, the adhesive polymerized with conventional emulsifier had high adhesion and low cohesion. Figure 9 suggests that the adhesive polymerized with ADEKA REASOAP SR-10 can improve cohesion. These new reactive emulsifiers have been researched in the field of advanced emulsion polymerization such as macro-emulsion or mini-emulsion.14-18 Applications include polymer colorants, polymer pigments, silica encapsulation, etc.19-21 Inorganic particles dispersed in water can be dramatically stabilized by an organic layer polymerized with ADEKA REASOAP. The advantages of composite particle are not only stability improvement but also chromogenic effects and dye fixation. The SEM images of silica (SiO2) encapsulated by acrylic polymer with ADEKA REASOAP are shown in Figure 10, and the comparison of dispersion between carbon black (CB) and CB encapsulated by acrylic polymer with ADEKA REASOAP is shown in Figure 11. Both of them dramatically improved dispersion stability and have been proposed for use in coatings, inks and toners. From the viewpoint of global warming and environmental concerns, water-based resins have gained more importance. ADEKA REASOAP can help develop highly-functional emulsions, which have a beneficial effect on water resistance and adhesion properties. Drawbacks of conventional emulsifiers have been overcome by these new reactive emulsifiers. However, their polymerization kinetics and oligomer characteristics remain to be fully elucidated. Further studies are expected to be done in order to contribute to the development of waterborne coatings technology. Asua, J. M. Prog. Poym. Sci. 2002, 1283 27. Landfester, K. Top Curr Chem. 2003, 227, 75. Nomura, M.;, Suzuki, K.; Macromol. Chem. Phys. 1997, 198, 3025. Chemical Daily, 2008.12. With 10 “emulsifier”. Kaoru, K. Development and application of new monomers, 311, CMC (1993). Beppu, N.K. ; Kazushi, K. Technology development of functional surfactant material Last Creation, 456, Publication of Technical Education (2005). Dahanayake, M.; Cohen, A.W. ; Rosen, M.J. J. Phys. Chem. 1986, 90, 2413. Nagai, K. Trends Polym Sci. 1996, 4, 122. Farinha, J.P.S. ; Martinho, J.M.G. ; Kawaguchi, S.; Yekta, W.; Winnik, M.A. J. Phys. Chem. 1996, 100, 12552. Nagai, V. Journal of Adhesion Society of Japan 1997, 33 (6), 233. Nagai, V. Jpn. Soc. Colour Mater. 2007, 80 (2), 19.